Former Breitbart News CEO Steve Bannon called the organization "the platform for the alt-right." 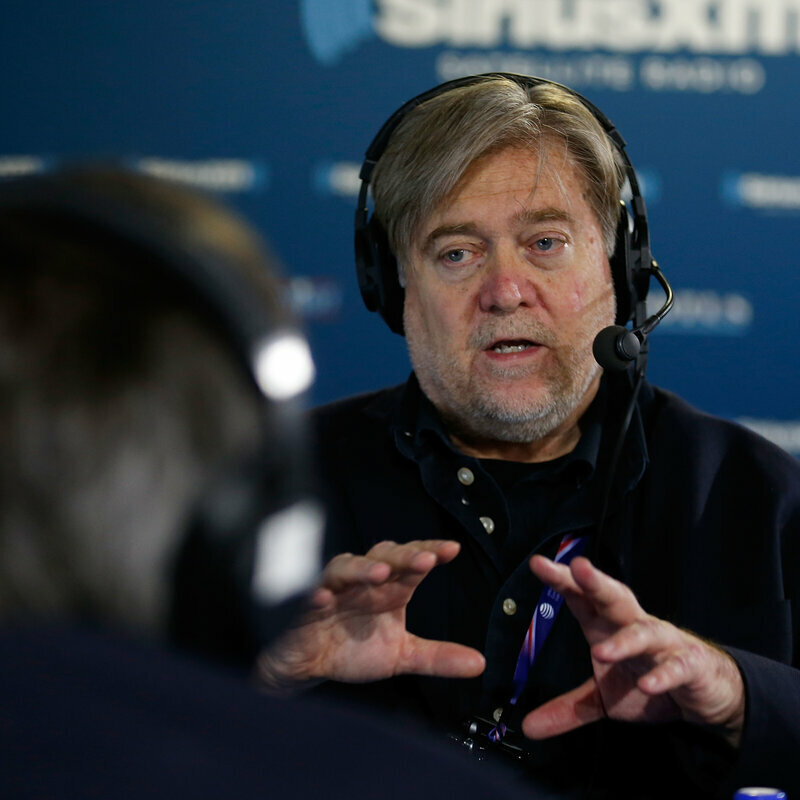 Steve Inskeep talks to Breitbart senior editor-at-large Joel Pollak for his take on Bannon. The most succinctly written profile of Steve Bannon and his ability to hide his intentions if full public view is in John Nichols' Horsemen of the Trumpocalypse: A Field Guide to the Most Dangerous People in America (2017). Steve Bannon, unlike the majority of Americans, knows the value of history. In fact Nichols write that Steve Bannon reads history. A lot of it. Bannon is of an age where he is more likely to be found with a book under his arm than one of the electronic screens into which his operations fed so much fake news before, during and after the 2016 presidential campaign. The former naval officer, special assistant to the chief of naval operations at the Pentagon, Harvard Business School graduate, Goldman Sachs investment banker, Hollywood mogul, new-media entrepreneur, right-wing propagandist, political Svengali and alt-president regularly reads his way into places no one ever expected to find him. Then as the smartest person in the room, he rewrites the rules to make history of his own. Bannon's remarkable intellectual and organizational skills, and his sly strategies, were always too bold to be understood by the tired mandarins who minded the infrastructure of a money-and-media industrial complex that was designed to maintain the elite status quo of the twentieth century into the twenty-first. The actual elites had little to fear from Bannon, who had spent a lifetime in their service and now proposed to cut their taxes and end the regulation of their business empires. But the bureaucrats, the managers, the commentators, the pundits, the consultants, the congressmen, the senators, the presidential candidates who for decades had made a nice living serving those elites had no idea what to make of the guy who proposed to kick the off the political playing field. So they ignored him, or ridiculed him, or condemned him. Bannon was embraced only by those desperate pretenders—fringe-hugging ideologue, socially awkward hedge fund managers, seemingly un-electable presidential candidates—who were willing to front for a modern Machiavelli who had no concern with titles, but a great interest in positioning himself as the new power behind the throne. Nichols posits that during the 2016 campaign, many commentators imagined that it was all a game for Bannon, and for Trump. This was the theory that launched a thousand speculative pieces by media writers who imagined that the haphazard race they ran after their billionaire mentors Robert and Rebekah Mercer put them together with Kellyanne Conway was part of some grand scheme by Bannon to jump-start an alt-right challenger to Rupert Murdoch's flailing Fox News network. But Bannon had already done that when he took over the late Andrew Breitbart's bad-boy website and made it an even more politically incorrect battering ram—the online crazy uncle that told conservatives they should embrace their worst impulses and … saying in 2014 that “quite frankly, we have a bigger global reach than even Fox.” He was finished with media manipulation and ideological disputation. He was ready to take charge. And Trump was his ticket. Impossible? Hardly. Bannon knew his history. The English society has always been xenophobic, and Bannon knew this from his historicism of the Continent. So that it was easy for Steve Bannon to convince the British Right-wing via Breitbart London propaganda to leave the European Union. Europe, in its history, had never been relatively at peace until post WWII. It was crucial to United States interests and the post-World War II Marshall Plan that the UK be part of Europe. Ian Kershaw in To Hell and Back: Europe, 1914-1949 (2015) posits that the decisive moment in the division of Europe came in June 1947 with the announcement by the US secretary of State, George C. Marshall, of a wide-ranging European Recovery Plan. The 'Marshall Plan,' as it is usually called, was a step of great symbolic significance-- profoundly political in aim, if economic in method—and of huge psychological importance in giving west Europeans new hope. It did not, as is often believed, create Europe's post-war prosperity, whatever the mythology that became attached to it. The Plan was simply too limited in scale to do that. It was highly important, nevertheless. The Marshall Plan was anything but altruistic. It helped American as well as European business, since most of the goods bought under the Plan were purchased from the USA. But beyond economic considerations, the Plan was overtly political. From it conception it was viewed as a weapon in the incipient Cold War. Helping to make Europe economically strong—and within Europe revitalizing the prostrate economic giant, Germany—would tie the western half of the continent to American interests, and provide the firmest barrier to Soviet expansion. The Americans thought of constructing a new Western Europe in the image of the USA. But the European countries were driven by their individual national interests. These would swiftly frustrate then defeat American notions of European integration. But from Stalin's perspective, worried that the security of the Soviet Union and its satellites was vulnerable to the superior economic power of the United States, refusing the Marshall Aid determine insured that there could be no Western interference in the consolidation of Soviet power in eastern Europe. His fear, most likely justified, was the economic aid from the USA was a vehicle which would have undermined Soviet political dominance in its satellite states. Stalin's decision meant the definitive split of Europe into two halves. As the US diplomat George Kennan witheringly put it, Europeans had neither the political strength nor 'clarity of vision' to draft a new 'design' for Europe. Scandinavians were 'pathologically nervous about the Russians,' the British were 'seriously sick,' and the other nations suffered from a similar lack of resolve to that which afflicted the British. In June 1948, the western Allies decided to establish a unitary West German state, France was compelled to alter its policy (of putting its country's interest first) into one of prospective cooperation on the allocation of German fuel resources and steel output. It was the genesis of the crucial Franco-German understanding that would form the basis of the later European Economic Community. They feared that such a step would subject Britain eventually to damaging economic competition, prevent the government taking independent steps towards recovery at home, aggravate the dollar drain, and thereby increase dependence upon US aid. Not least, British national interests were seen to lie in ties with the Commonwealth and a revival of world trade. The American diplomat William L. Clayton, one of the key figures behind the Marshall Plan, was close to the mark in his assessment: 'The trouble with the British is that they are hanging on by their eyelashes to the hope that somehow or other with our help they will be able to preserve the British Empire and their leadership of it.' As George Marshall himself summed up, Britain wanted to 'benefit fully from a European program while at the same time maintaining the position of not being wholly a European country.' Some of the smaller European states took a similar stance to that of Britain. The American aim of European economic integration was, therefore, a non-starter. European economic cooperation, when it gradually emerged, would not flow from the Marshall Plan but from the subsequent Franco-German rapprochement of Ruhr coal and steel. And Britain would have no part in it. The Marshall Plan confirmed the division of Europe into two hostile blocs. On April 4, 1949, the Brussels signatories together with the USA, Canada, Italy, Portugal, Denmark, Norway and Iceland signed the Treaty of Washington, establishing the North Atlantic Treaty Organization (NATO), committing themselves to mutual assistance in the event of an attack against any one of them. NATO offered Western Europe a sense of security that its own threadbare defenses could not provide. Its importance was to a large extent symbolic, as an expression of unified commitment to the defense of Western Europe. In reality, it was a fig-leaf. Soviet ground forces outnumbered those of the western Allies by 12 to 1; and only two of the latter's fourteen divisions stationed in Europe were American. Kershaw cautions that if the Americans had indeed pulled out of Europe by 1947 as they had initially intended to do, the gravely weakened former European great powers, France and Britain, would have been capable of overseeing the successful reconstruction of western is doubtful. The American presence in Europe guaranteed the triumph of capitalism there. That was certainly not universally welcomed. The Left, especially, hated it. Nor was the growing 'Americanization' of Europe, as many saw it, warmly greeted everywhere. As before the war, it was dismissed in some circles as a sign of Europe's cultural decline. Whatever disadvantages the lasting American presence brought, however, they were greatly outweighed by the advantages. Under the shield of the United States, Western Europe had the opportunity to find its own forms of unity and start to put the nationalist dangers of the recent past behind it. Marshall Aid gave European economies important sustenance, and, as a report in 1951 put it, the 'strength to work their own recovery.' Huge amounts of spare labor and productive capacity, pent-up demand, and technical innovation lay behind the surge. Lessons learn about reliance on market forces to restore pre-war conditions, as had prevailed after the First World War, and the application of Keynesian techniques of monetary policy to stimulate growth, also played a significant part. And Western Europe became more economically interwoven with the technologically advanced and prosperous USA than ever before. Eastern Europe, rejecting Marshall Aid, soon came to lag far behind the western half of the continent. But beneath the unremitting Soviet repression, economic growth there too, accelerated sharply after the war and material progress was impressive. Where impoverished and underdeveloped societies had been torn apart by nationalist, ethnic and class conflicts in the interwar years, there was now a basis of relative prosperity and stability, however forced the process had been. When Winston Churchill did envisage a 'United States of Europe' in 1946, e neither included Britain in his proposed new political entity nor imagined a world that was not still dominated by the great powers (in which category he was determined to ensure Britain's presence). But the emerging Cold War and the need to ensure that the shoots of economic growth were not killed off by nationalist rivalries combined to create the beginnings of pressure for greater coordination and integration of both the economies and the security of Western Europe. The formation of the Organization for European Economic Cooperation (OEEC) in 1948, and the following year of NATO and the Council of Europe (committed to European cooperation in matters relating to the rule of law and the upholding of fundamental human rights), marked a modest start. Combining idealism and pragmatism, these were still fairly small steps on the way towards reconciling national interests with greater levels of European integration. The historic splits were too deep to allow national interests to be swiftly or comprehensively overcome—and Britain, especially, was allergic to any possible diminution of its status or sovereignty. When the French advanced a scheme—the Schuman Plan—in 1950 for joint control of Ruhr coal and steel production, questions of national security through controlling German's potential for rearmament, following the foundation of the Federal Republic of Germany, were more important than idealistic notions of European unity. But it turned out to be the decisive step—the beginning of the path that would lead to a 'common market' and the creation of a European Economic Community with its own governing institutions. Kershaw closes To Hell And Back on a hopeful note. He declares that out of the ashes, against all probabilities, a new Europe, divided within itself but with each part soon resting on more solid foundation than had ever seemed likely at the end of the war (WWII), had with remarkable speed taken distinct shape. The future lay open, [yet Brexit may mark the end of it]. But amid the lasting scars, physical and moral, of the most terrible war of all time, possibilities were emerging of a more stable and prosperous Europe than could ever have been imagined within living memory, in the decades when the continent had come close to self-destruction, [and may repeat this self-destruction via Brexit]. John Higgs, a Brit, in his Stranger Than We Can Imagine: An Alternative History of the 20th Century (2015) writes of the benefits that liberal governance brought the post-World War UK and the West in general. Higgs posits that economically, the first half of the twentieth century had been grim. It had been home to financial horror stories such as the hyper-inflation of the Weimar Republic, where a glass of beer cost 4 billion marks in 1923, and the Great Depression itself. But the period from the end of the Second World War to the 1970s looks, from the perspective of the early twenty-first century, like something of a Golden Age. The immediate situation of the postwar would was bleak, and yet untold millions were lifted out of poverty over the decades that followed. Malnutrition and starvation in the Western world were mostly confined to the pages of history. Wages rose and people became acquainted with the term “disposable income.” Regular working people gained access to everything from motor vehicles to central heating. Healthcare provision improved enormously, and life expectancy rose. The average man in England and Wales was expected to live to forty-six in 1900, but that figure rose by over a third to seventy-three by 1990, but the figure rose by over a third to seventy-three by 1990. For women, the same figure rose from fifty to seventy-nine. In 1957, the British Prime Minister Harold Macmillan said, “Let us be frank about it—most of our people have never had it so good. Go around the country, go to the industrial towns, go to the farms and you will see a state of prosperity such as we have never had in my lifetime—nor indeed in the history of this country.” From a contemporary perspective that statement seemed complacent, but from a historical viewpoint it was a fair comment. Steve Bannon is the most dangerous man in the Western world. He has managed to aid in the destruction of democracy here in America and has helped Donald Trump into Office as a signal that Traditionalism/Racism and White Nationalism is the way of the future of the United States and Europe. He like Hitler understands human nature of Eurocentric man and he using it to undermine every democracy worldwide. Beware! That sustained low rumbling hum on the horizon are swift boats. True: flip-flops guard against onerous pop-top cuts, but are made for feet not nouveau elite. Kay Benny! I ain't got a penny, but wish to promote Sandy Hook parents as guest speakers. Courageous, vibrant forever young report: MARY GRAVITT !